Why Do Gasoline and Oil Futures Move Differently? When the crude oil markets moved into bearish territory around late 2014, the markets were excited at the prospects of cheaper fuel prices. 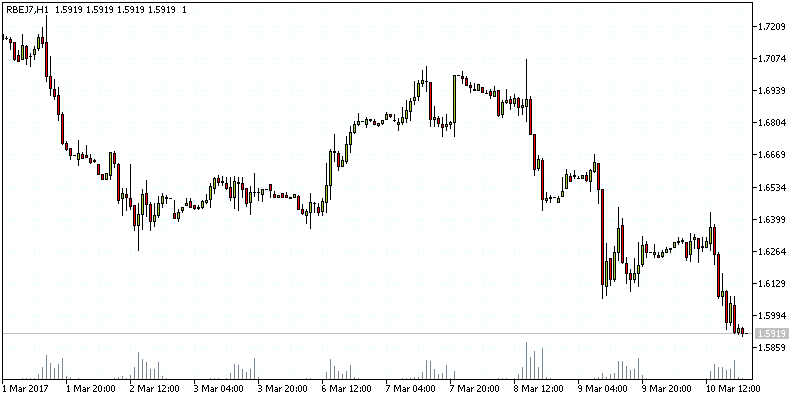 The West Texas Intermediary (WTI) crude oil, primarily used in the United States fell below the $100 mark. Unlike the recovery seen around 2008, in the immediate aftermath of the global financial crisis, this time around, oil prices were poised to fall even further. As crude oil prices fell, approximately 74% from the highs of $113 a barrel, it was a similar story with gasoline prices. The RBOB gasoline futures fell close to 71% as a result. While the declines in both crude oil and gasoline futures are more or less the same, the rate of declines were different. The chart below shows a comparison of the CL crude oil futures (area chart) and the overlay of the RBOB gasoline futures price chart (depicted with the line chart). This often brings up the question as to why the price of these two futures behave differently when in fact they are part of the same energy fuel complex and thus should see a more stronger correlation. To understand this, one needs to take a close look at the composition of the gasoline futures market and the product itself, and compare it to the broader crude oil market. Is RBOB gasoline futures same as RB gasoline futures? Is there any correlation between oil and gas prices? Why are gasoline prices not uniform across the U.S.? What factors influence gasoline prices? Gasoline futures are part of the energy futures complex and cleared on the New York Mercantile Exchange (NYMEX) part of the CME Group. Gasoline futures trade with the ticker RB on the NYMEX and represent a standard contract size of 42,000 gallons per contract. RB futures are also traded on the Tokyo Commodity Exchange (TOCOM) where the contract size is 50 kiloliters. Here, the main difference is that the gasoline futures contracts that are cleared on the TOCOM are priced in Japanese yen. Besides the above, other gasoline futures contracts include the e-mini gasoline futures and the ICE gasoline futures contracts. Among the different types of gasoline futures, the NYMEX/CME Group RB gasoline futures are used as the benchmark reference. 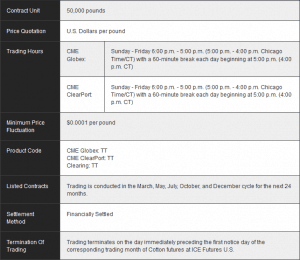 On the CME Group, the RB gasoline futures are priced in U.S. dollars and cents with the minimum price tick of $0.0001 per gallon or $4.20 per contract. 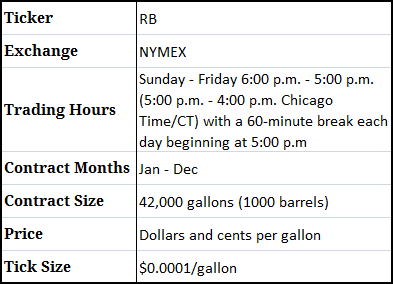 Below is a summary of the RB gasoline futures contract specifications. 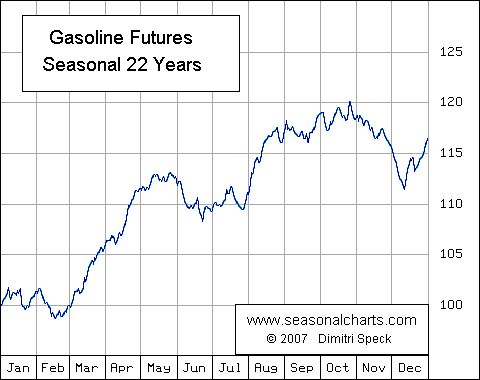 Gasoline futures or RB futures are commonly referred to RBOB gasoline futures and they are one and the same. The term RBOB is a scientific name for gasoline and stands for Reformulated Gasoline Blendstock for Oxygen Blending. The RBOB is a type of gasoline blend and in the layman terms it is referred to as the unleaded gas (since 2006). The quality specification needs to be 10% denatured fuel ethanol with 92% impurity, to which another 10% ethanol is added. When the markets talk about benchmark gasoline or petrol prices, it is the RBOB gasoline or unleaded gasoline prices. For crude oil to become gasoline futures, it needs to undergo a process. The refinery process involves shipping the crude oil from the port of destination to the local refinery, which in the U.S. are primarily situated in the Gulf coast region. The crude oil is boiled to the point that it turns into vapor, which is then distilled and turned back into liquid. The distillation process is influenced by different temperatures and gasoline, heating oil are just some of the by-products that come as a result of the crude oil refinery process. Cracking is another process from where the hydrocarbon molecules are broken down. The octane level is one of the most important aspects of gasoline products and this is one of the reasons why there are many different types of end products in gasoline. A higher octane level leads to a higher compression rate, thus leading to higher efficiency. 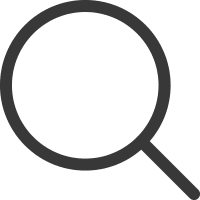 Depending on the compression rate and the octane levels, the gasoline prices can be different, although all the retail products are part of the same product. RBOB gasoline is used not just as automobile fuel but also used in appliances such as lawn mowers, generators including in paint and pesticides. There is no doubt that gasoline prices have a lot of similarity to crude oil prices. After all, gasoline is derived from crude oil. In most cases, the differences in the price behavior in due to what is known as a crack spread. Crack spread in futures is nothing but the difference of one commodity and its by-product, or simply the price difference (in the futures markets of course) between the wholesale petroleum product and the crude oil prices. The crack spread gives a ballpark idea on the refinery costs for converting crude oil to the by-product, which is gasoline in this context. Crack spreads can include crude oil and gasoline, gasoline and distillate fuel and so on. The crack spread is one of the reasons why you can expect to see a lag in the price of gasoline futures compared to crude oil futures markets. The crack spread can be an indication on the broadening and widening of the profit margins for the refineries. It can be an important indicator to watch as a decline in the crack spread below the refineries break-even point indicates that the refinery is running up losses. 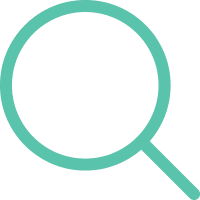 Crack spreads can also offer critical information into the supply/demand factors that are often leading and can foretell a price increase or decline. On average, it takes about four - six weeks for any changes in oil prices to follow through to gas prices. Therefore, you will often find the volatility on crude oil futures which will then have a follow on effect on gasoline prices. 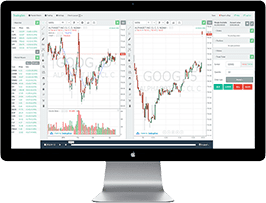 This can present as a good indication when you want to trade gasoline futures as the price action in crude oil futures prices can alert you to the potential changes that can come about in the gasoline futures prices. While there is a strong correlation between crude oil prices and gasoline, the price of the U.S. dollar has a larger impact on the international crude oil prices. Because, WTI and Brent, the two versions of crude oil are priced in U.S. dollars, the fluctuation on the U.S. dollar’s exchange rate (relative to the currency from where it is shipped) can have a big impact. The chart below shows the overlay of Crude oil futures, the U.S. dollar index (DXY) and gasoline futures. Although the benchmark gasoline prices are quoted in the media and used as reference in relation to how high or low gas prices are, in reality, the fuel or gasoline prices greatly differ when you fill your automobile. According to some estimates, Colorado, Montana, Utah and Wyoming boast of the cheapest prices in the nation, while California and New York have higher gasoline prices in comparison. The difference in the pricing of gasoline prices is of course a number of factors. Firstly, the RBOB gasoline futures price is not the ultimate product that goes into your fuel tank. Refineries further modify the gasoline to make it into different grades. Which is why, airplane fuel is so different both in grade and price, compared to the regular fuel one uses. Besides the grade of the fuel, the location of the refinery also plays a major role. Fuel or gasoline prices are generally cheaper around places close to a refinery as there is practically no further transportation cost involved. Whereas, the further inland you go away from the refinery the more expensive the gasoline prices become. Finally, there are also taxes that play a role in influencing the price of gas you pay at the gas station. The Federal tax is in the rate of $0.184 for a gallon with an average of $0.273 across all the states. For a more detailed outlook on the state-by-state tax prices, refer to this page from the EIA website. From the above four, gasoline prices do not have control on the crude oil prices and the cost of refining crude oil. The EIA estimates that for a $1/barrel change in the price of crude oil is equal to $0.24 per gallon of gasoline prices. Besides the above, the general market forces of supply and demand play a role as which, which brings the factor of seasonality into the equation. Gasoline prices are said to reach their seasonally low prices in the December months and pick up pace by April - May. The weeks leading into the 4th of July week is often considered to be the most bullish for the oil markets at large. The months from July – September also see peak demand for gasoline, pushing prices higher. Therefore, it is not uncommon to find that the weekly U.S. commercial crude oil and gasoline inventories tend to post large draw-downs around these periods. Last but not the least, hurricane seasons are something to be cautious about when trading gasoline futures, especially along the Gulf of Mexico where most of the gasoline refineries are concentrated. For example, after the Hurricane Katrina, gasoline prices spiked to $5.00 a gallon, which shows how volatile prices can be to changes in the weather. Therefore, in conclusion, gasoline futures are no different from Crude oil futures in terms of behavior and pricing, despite both these products belonging to the same commodity family of energy or fossil fuels. They tend to behave somewhat similarly due to the relation between the two products. Unleaded gasoline or RBOB gasoline futures (RB) are a by-product of crude oil, and there is close to a 70% influence of crude oil prices on gasoline prices. In a majority of the cases, oil prices have an influence on gasoline prices and not the other way around, meaning that gasoline prices tend to lag the prices of crude oil. Besides the influence of crude oil prices, other factors include taxes, refinery and distribution costs that all account for the difference in the way gasoline futures prices behave compared to crude oil prices. The final product based on differences in the composition of the fuel also has minor difference in pricing. 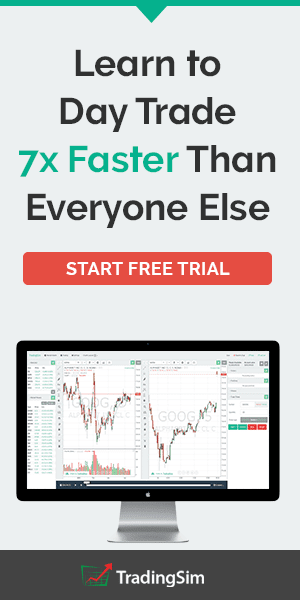 To get an idea of what the costs can be, traders can look at the prices of the gasoline futures and add some overheads to account for taxes and other costs to get a fairly rough idea on the retail price of gasoline products on average. Last but not the least, in terms of volatility, crude oil futures prices are seen to be more volatile than the gasoline futures pricing. While supply and demand are two factors that pretty much affect the price of both crude oil and gasoline prices, oil prices are directly influenced by the U.S. dollar’s exchange rate, the production capacity from the OPEC countries. There are some similarities in the factors that affect the price of both crude oil and gasoline, which are weather patterns and of course, the seasonality in the gasoline products which are somewhat different to the seasonality of crude oil. Therefore, for all the above reasons and more, crude oil and gasoline futures prices do not behave similarly. However, the strong level of correlation means that you can expect changes in one futures’ pricing based on the prices in another product. So the next time you see a drop in crude oil prices, you can expect a drop in gasoline prices as well, although it may or may not be at the same pace.